These boots were purchased about 8 years ago. I needed some work boots to wear in the garden at the farmhouse I was living in. The old house was surrounded by pecan trees, muscadine vines, and apple trees. There was a black walnut and cherry wood cabin on one corner of the 10 acres, and a pond sat on another corner. I wore the boots almost daily while feeding my chickens- I had several- mainly cochins, my favorite type of chicken. I like their feathered feet and mild mannered way. They would scoot and peck at the corn. I wore them while I worked in the garden, and sitting in the swing that hung low off one of the branches of a pecan tree. Then, in 2009, the housing market crashed, leading me to another area in search of better opportunities. I wore the old boots less, but still kept them. I did manage to wear them on disaster recovery efforts and while I worked as a stable hand for a brief time. Even after buying a new pair while in Texas, I chose them mostly. I wore the old boots of mine while renovating the store I own. At present the leather has faded, been scratched and distorted, the soles are worn free of tread and are coming lose from the rest of the shoe. I did retire them to the front porch a few weeks ago and tried to wear them once or twice since. Now they hurt my feet. I didn’t mind that they were old. I didn’t mind they were faded. I didn’t mind that they were ugly. 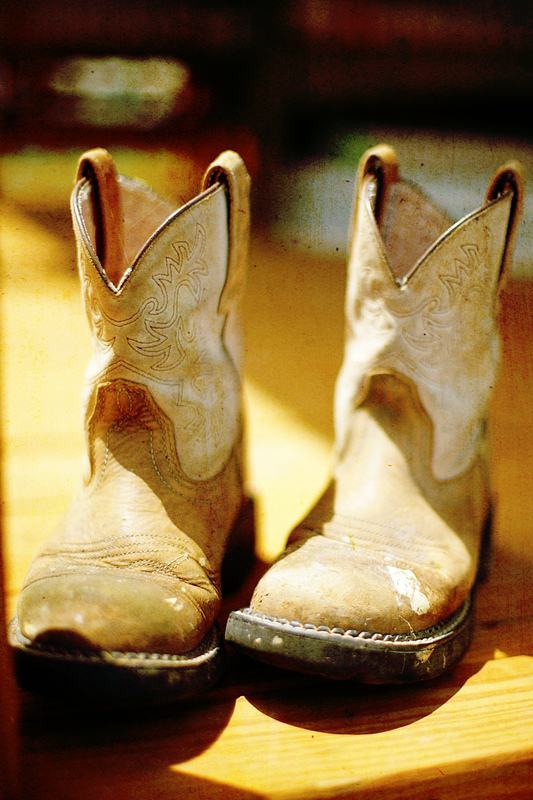 I wore them proudly because they had been good boots and had taken me many places. They protected my feet from all manner of debris and weather. Now it is time to retire them for good and replace them. To the burn pile they will go. I will have to get another pair soon. I can only hope they will be just as good or better. I hope to go to new places and will need a good pair of boots.